Today is brought to you..
Breakfast….but no baking ( from a can). Blue…the color of my living room wall (s). It makes me happy every morning. The color is Better Homes & Garden # 105 from Walmart. Don’t look at my curtains ( I said don’t look!) I’m pretty sure that’s a decorating sin of some sort but they have no hope of being fixed soon. And a Big Big Belly…..in my jammies. I think this belly has outgrown all but 2 of my maternity shirts in the last week. 36 Responses to Today is brought to you..
where oh where did you get your alphabet cards? I have been looking for some jsut like that all over Etsy, but haven't found any I like! Yay for a happy baby bump! And thanks for letting us know the color, I think I have a table that needs to be that color. #2 – who cares that the roll came out of a can…IT LOOKS DELICIOUS! #6 – I see that HST quilt in the background…have I told you how jealous I am of it….made me want one of my own, so I'm putting one together, but I'm giving it to my prego sis as a baby shower gift. Sorry for such a long commen, but your post has so many great things happening at once. That cinnamon roll is making me HUNGRY! And I agree with you, that fish fabric is the cutest! I've got a little rocker almost exactly like that one and your recent posts on painting it have encouraged me to go ahead and paint mine too! I'd been deciding …. but yours is so cute I can't pass up making mine cute too! Love that blue. Getting ready to paint our bedroom blue or beige and I think this might be the deal breaker! Nice post! 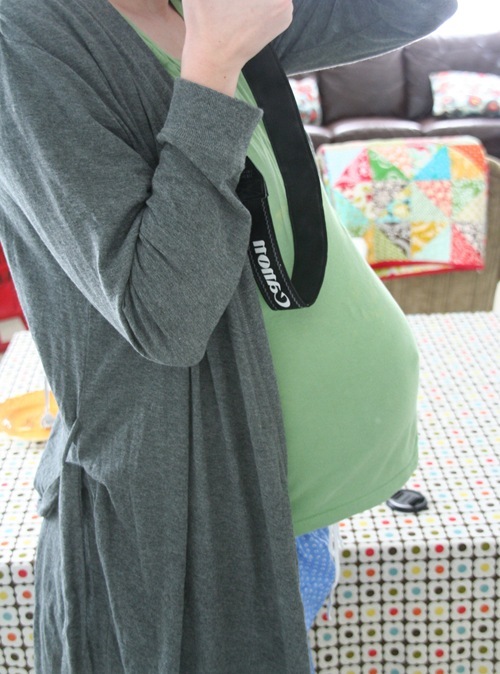 There are so many new and soon-to-be-new mommas on blogland, it's nice to share in your excitement and preparations. You've got a skinny girl's baby bump! You can tell you'll go right back to your former shape after you give birth. I love that you're willing to put up a picture of yourself, pregnant, and in jammies. Good for you!! ;) How much longer will you have that belly? I think you meant Beautiful Belly! I'm telling you, mine NEVER looked that good! Oh, I remember when the maternity shirts were outgrown! I love the fact that you shared your belly with us. The thought of an impending birth makes me happy. I am filled with joy that you will nurture this child because you seem to have great attributes for a parent. Look how cute you are! Happy Monday! Ooh! I can't wait to hear the good news of your baby's birth! I love that color blue; it's what we have in our learning room. You make a very cute prego girl. 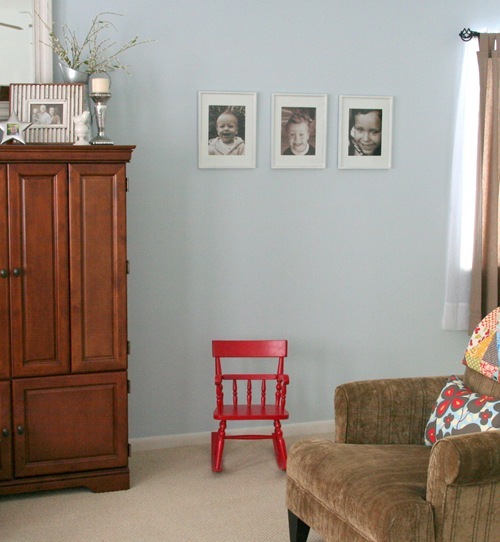 Your little one must be due soon? And thank you so much for the wonderful ideas and tutorials, they are the best! Your B's are all B-eautiful including your B-elly! That's it, we are moving in! Happy Monday to you too Allison! You can get THAT out of a CAN!!!! No way! Gorgeous color and that is my favorite color baby blue. Love what you have done and I also love that belly of yours. From the looks of it it will not be long before the baby is coming.It is all worth it once the baby is born. The B blocks are so cute. Have a wonderful blessed day. Saw the link to your beautiful blog over at Farm & Fru Fru. I'm so glad I stopped by! What a lovely site you have here :) Now to click on your Followers tab and sign-up! love the wall color and cute cute belly! 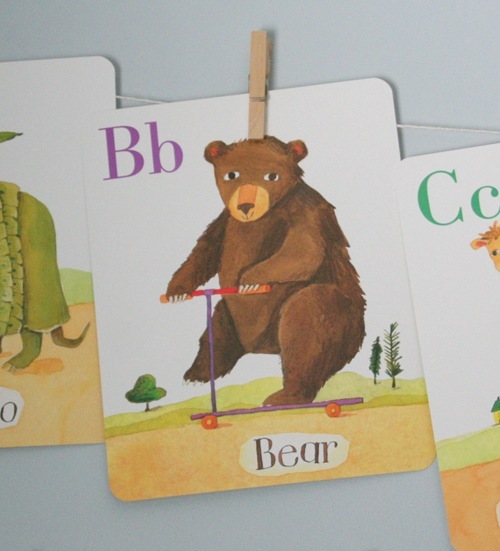 those alphabet cards are adorable…where did you find them? You so stinking cute Allison! You make me laugh. I love your baby belly! So adorable. Don't forget another important "B"…BEN! lol. I just love the cinnamon roll!!!! hi! i just found your blog (and love it!) and would love to know about where you bought the alpha cards, too. they are super-cute! as is the whole shared room!